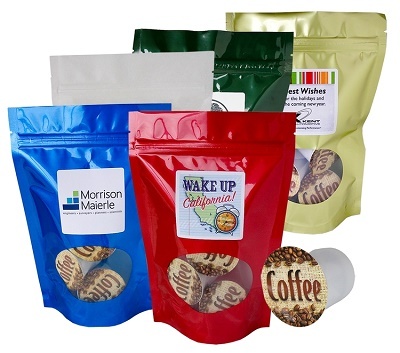 An elegant metallic foil bag containing 4 gourmet coffee K-Cups. Each K-Cup makes one mug of delicious (kosher) coffee. Bag colors: Red, White, Blue, Gold and Hunter Green. Standard coffee variety: Richard's Blend. Optional Flavors: Double French Vanilla, Hazelnut, Cinnamon Crumb Cake, Cuban blend, Costa Rican blend, Hawaiian blend, French Roast, Kona Blend, Italian Espresso Blend, etc. Please inquire for availability and pricing. Perfect for logo coffee, Keurig, k-cups, kcups, coffee pack, corporate gifts, coffee gifts, coffee packet, coffee gift, coffee packs, coffee bag, coffee pouch, flavored coffee, client gift, corporate coffee gifts, holiday or a holiday gift. Imprint Area: 2-1/4" x 2-1/4". Label size 2-1/2" x 2-1/2". Full bleeds are not available. Production Time: Approximately 10 working days after proof approval. Product Size: 6" x 9" x 2"